Adding a feature wall to a room is great way to update your home’s décor. Feature walls can be designed any number of ways, whether it’s a bold or more subdued decorative statement you’re looking to make within a space by highlighting a particular wall. Fireplace feature walls are a great way to not just update a home’s look, but to add some practical usefulness to a room. They’re the perfect marriage of style and functionality. Here are five fast facts about fireplace feature walls that show why they make sense for any home. A fireplace changes the look and feel of any room. Along with the cozy warmth it provides, the look of the flames also add an appealing aesthetic that livens up a space. Surrounding that fireplace with a stylish feature wall only enhances its attributes. Feature walls can elevate a room’s dull design by adding a different aesthetic in one part of the room. When done right, this design choice won’t clash with your existing décor, it will complement and harmonize with it. Fireplace feature walls can be more than just the focal point of a room, too. In the hands of a skilled designer, a fireplace feature wall can become a stunning home showpiece. But what if a room’s space limitations or your design tastes dictate a more scaled-down approach to a feature wall? That’s certainly doable, as fireplace feature walls don’t necessarily have to be a room showpiece, either. A room corner with a smaller electric fireplace set within a smaller feature wall still adds a stylish touch to any room. A fireplace feature wall can be added to a room’s corner. Making sure your fireplace feature wall corresponds with your décor is important. So when deciding on what type of material your feature wall will be designed with, a high level of customization should be a priority. Melamine panels offer great design flexibility to help you achieve your desired look. At Organized Interiors, our Design Studio offers hundreds of melamine panel styles, textures, and patterns to choose from. You’ll also want plenty of options when it comes to choosing the type of linear wall-mount electric fireplace that’s set within (or hung on) your feature wall. The size needs to be just right and you’ll want to be able to choose a model with all the convenient electric fireplace features that cater to your specific needs. Most of use would envision a feature wall as something best suited for the living room or family room. But because fireplace feature walls are able to be designed in a wide variety of layouts and sizes, they can be added to a number of different rooms. Fireplace feature walls are ideal for a finished basement. They can dramatically improve the ambiance and look of a space in the home that is typically dark and drab. The supplemental heating provided by electric fireplaces also makes them well-suited to cold basement areas, especially during the winter. Your bedroom or home office are additional areas where fireplace feature walls can be added. Even smaller feature walls incorporated into these rooms’ design can make a big impact on your comfort level. 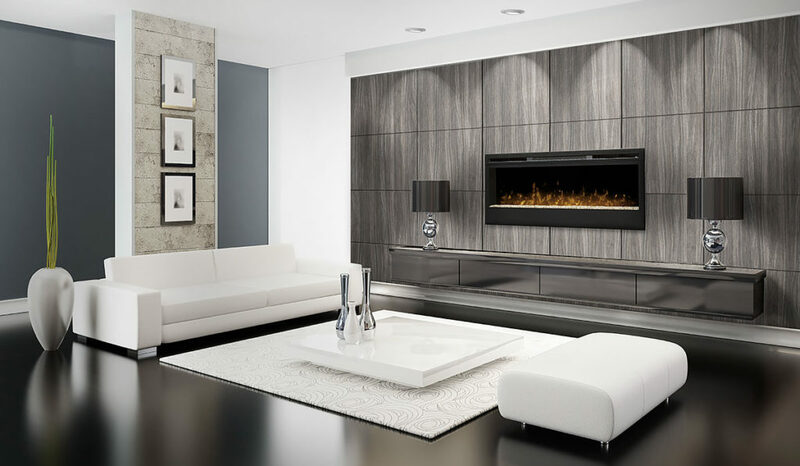 Unlike high-maintenance wood burning fireplaces, one of the biggest benefits of a feature wall’s electric fireplace is that it’s virtually no-maintenance. Say goodbye to wood cutting (or paying for firewood delivery) and cleaning up messy ashes. The most maintenance you’ll face with an electric fireplace is simply wiping down its front glass once in a while, or replacing one of the fireplace’s bulbs occasionally. The other notable convenience of electric fireplaces is that you can start a fire instantly with the push of button. You can also control the heat output with the fireplace’s thermostat and even change the fireplace’s colour theme to suit your mood. Fireplace feature walls provide you with the ability to use cost-effective supplemental heating for your home. Depending on its temperature setting and your hydro rates, an electric fireplace costs approximately 14 to 18 cents an hour to operate when using the heater. Part of that cost-effectiveness extends to the fact that you can also lower your home’s thermostat and set your feature wall’s room to a comfortable temperature while you’re spending time in it. Electric fireplaces can also be used during the year’s warmer months to provide an ambiance boost with its lifelike flames, but without the heat turned on. On this setting, it will only cost a few cents per hour to operate the electric fireplace. A feature wall doesn’t just look great – its low-maintenance electric fireplace also provides cost-effective supplemental heating. Highlighting a wall in either a big or small way with a beautiful fireplace feature wall is one way to take your room’s look to the next level. 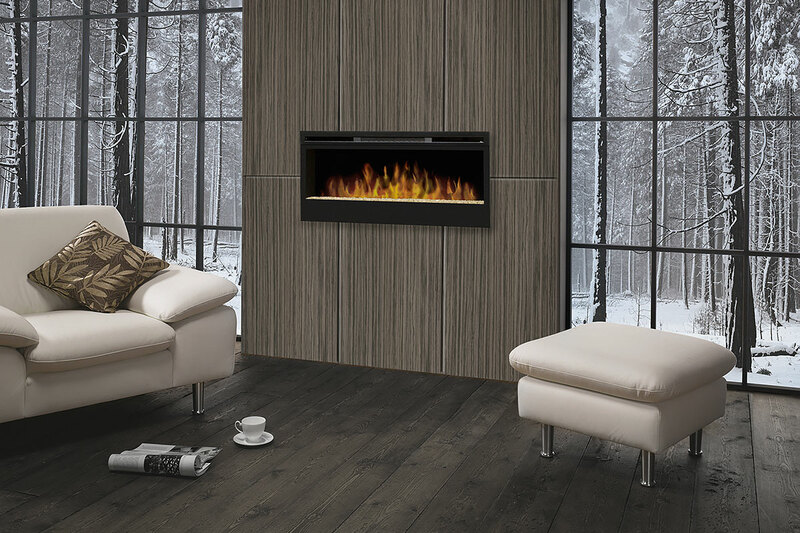 Add an electric fireplace to the mix and that aesthetic boost becomes augmented with convenient, enhanced functionality. An Organized Interiors design expert can visit your home to provide guidance on where a fireplace feature wall will work best in your home. Simply schedule a free in-home design consultation with us today. As the winter approaches, you’ve decided it’s time to choose a fireplace for your home. The heating benefits and ambiance boost a fireplace provides will surely look even more attractive as the temperature drops and the snow begins to fall. Each choice has their undeniable benefits. For example, an electric fireplace is much more cost-effective and low-maintenance. On the other hand, today’s impressive electric fireplace technology hasn’t yet managed to replicate the delightful smell that only a burning log can produce. And a natural gas fireplace offers the convenience of starting a fire at the touch of a button. Weigh the individual pros and cons of wood-burning, natural gas, and electric fireplaces, however, and the latter emerges as the clear choice. And here are the top 13 reasons why. The costs of adding a wood-burning stove or fireplace to your home can quickly start piling up. There will be major wall construction and masonry work required, including the building of a chimney. For natural gas fireplaces, venting and gas lines will need to be set up. That’s a lot of expenses before we even factor in the cost of the fireplace itself. Electric fireplaces are a more affordable way to add the comforts of a fireplace to your home. Even higher-end electric fireplace models will prove to be a more cost-effective solution than a wood-burning or natural gas fireplace setup. Installation of an electric fireplace, however, is significantly easier and much less restrictive. Many electric fireboxes just plug into an electrical outlet – it doesn’t get much simpler than that! Other fireboxes and all linear wall-mount electric fireplaces will need to be hardwired using either 120V or 240V. Even if you’re creating a larger-scale feature wall with a linear wall-mount fireplace, the work that’s required is simply no comparison to what’s involved with the installation of a wood-burning or natural gas fireplace. Rooms that traditionally haven’t been able to accommodate a wood-burning fireplace (like a bedroom or home office) now can with an electric fireplace. Those in apartments and condos can also enjoy the benefits that fireplaces provide. Compared to a wood-burning fireplace or stove, an electric fireplace creates a far smaller footprint within your room. A hung electric fireplace only protrudes 6″ to 8″ into a room. If it’s recessed into your wall, it’ll also only require about that much depth space. The ease of installation with electric fireplaces also gives you a lot more flexibility in terms of where it can be located. With wood-burning and natural gas fireplaces, their location will be tied to the limited areas available to install a chimney or wherever the gas lines can fit. Underutilized corners in a room can become more useful with the addition of an electric firebox. And an electric firebox mounted within your entertainment unit or bookshelf also saves you space. The potential safety risks of having firewood burning inside your home go without saying. Owners of wood-burning fireplaces also have the hazards of smoke and ash inhalation, carbon monoxide poisoning, and chimney fires to worry about. Anything that uses natural gas also carries an inherent risk with it. Electric fireplaces are a much safer option and give you greater control over how your fireplace operates. You’ll have zero worries about the harmful gasses and fires raging out of control that can potentially occur with conventional fireplaces. Many models come with an automatic shut-off feature for a higher degree of safety. And an electric fireplace won’t pose a risk of anyone getting burnt because the front glass stays cool when it’s running. That’s an especially important safety feature if you have young children or pets. Both electric fireboxes and wall-mount electric fireplaces offer a wide range of customization options to accommodate your needs and design tastes. An electric firebox comes with a range of door and trim kits to choose from. They can also be combined with a fireplace mantel that comes in a variety of finishes. You also have the option to sit an electric firebox within an entertainment unit below your television. A linear wall-mount electric fireplace adds an even more sophisticated fireplace look to your home. They also offer some different operating features and custom options (like the ability to embed a fireplace within a feature wall). Because electric fireplaces and fireboxes allow for so much customization, you’ll find that complementing your home’s décor becomes even easier. The design possibilities are almost limitless and you’ll appreciate the freedom that comes with matching your electric fireplace to your home’s architectural and design style. An electric fireplace in any room creates a dynamic focal point that unquestionably makes the space more inviting and comfortable. And one way to take that concept to the next level is to create a fireplace feature wall. 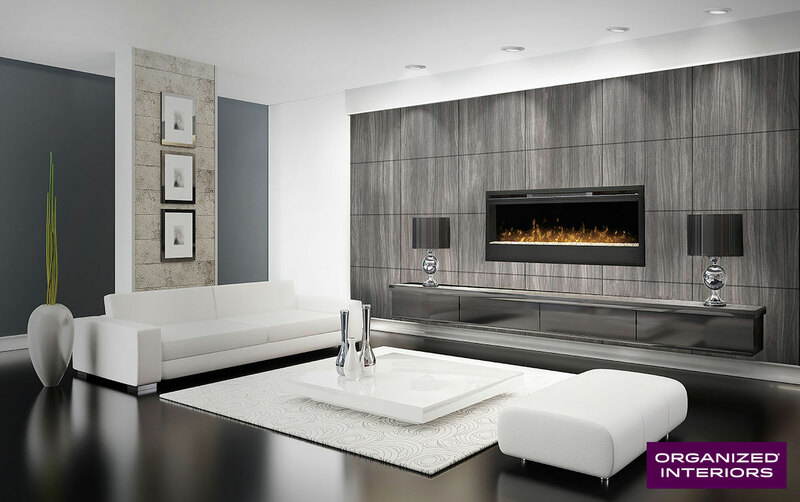 A beautiful fireplace feature wall can be created by setting a wall-mount electric fireplace within either your drywall or stylish melamine panels. Organized Interiors has hundreds of melamine panels of varying styles, textures, and patterns to choose from. Create a beautiful home showpiece with a fireplace feature wall. By using supplemental heating (also known as zone heating), you can lower your thermostat and heat specific areas of your home that you’ll be occupying more frequently. That reduces your energy costs. You’ll find that electric fireplaces are a great supplemental heating solution. If the house is feeling chilly and you and the family are planning on a movie night in a living room outfitted with an electric fireplace, leave your home’s thermostat where it is. After all, why heat up the whole house when everyone is gathered in one room for several hours? Just set the fireplace’s thermostat at a comfortable level and enjoy your evening. Organized Interiors carries electric fireplaces and fireboxes from industry leader Dimplex which can heat rooms up to 1,000 square feet. Wood-burning and natural gas fireplaces lose anywhere from 50-70% of their heat, depending on various factors. An electric fireplace, however, wastes little of its energy. And with the heat on, electric fireplaces only cost around 14 to 18 cents an hour to operate. The work required to operate and maintain a wood-burning fireplace is significant. You’ll need to make sure you’re either buying firewood or cutting it yourself. Then you need to keep it stored in a dry area and lug it inside when it’s needed. And, of course, there’s the messy cleaning up of ashes and soot, as well as the requirement of getting your chimney cleaned every few years. All of this extra expense and maintenance time should be factored into your fireplace-buying decision. Compare all of that to the virtually no-maintenance nature of an electric fireplace. The only cleaning required is to simply wipe down the front glass occasionally, just as you would any other surface in your home. Replacement of a fireplace light bulb may also be needed occasionally. Other than that, your electric fireplace shouldn’t require any other maintenance, as they’re built to be reliable and long-lasting. Wood-burning fireplaces use up precious natural resources, aren’t energy-efficient, and pollute the air. Natural gas does burn cleaner, but also uses up natural resources. Electric heating, on the other hand, only uses a small amount of electricity to operate, has zero emissions, and is highly energy-efficient. When it comes to a home fireplace, you can’t get much more eco-friendly than that. One concern with buying an electric fireplace is that the flames they produce don’t quite look like the real thing. Electric fireplace technology has come a long way in recent years and today’s models now produce amazingly realistic flames. Dimplex’s patented flame technology is the best in the industry. You’ll barely be able to distinguish the difference between a real flame and the flame produced by a Dimplex model. Visit our showroom to see for yourself! The flames an electric fireplace produces look amazingly realistic. Starting a wood fire involves a whole process that can sometimes result in a smoke-filled home. And maintaining your home temperature at a comfortable level with a wood fire is an inexact science. Too cold? Throw on another log or two and then wait for it to warm up. And if it’s too hot, you’ll probably end up just opening a window to cool off until the temperature in the room lowers. It’s not exactly the most convenient of heating methods. Conversely, an electric fireplace or firebox starts up with the simple press of a button and produces a consistent room temperature via its thermostat control. The temperature is displayed on the fireplace’s floating LED display. Temperatures can even be adjusted from your couch by using the convenient multi-function remote control the electric fireplace comes with. Electric fireplaces also come with features like an automatic shut-off timer and a range of colour themes to suit your mood. Even when it gets warmer, your electric fireplace will serve a valuable function. To enjoy the ambiance boost that a fireplace provides without the heat production, simply turn off your electric fireplace’s heat function. The flames will continue to display and you’ll be able to achieve that cozy, inviting feel in your room during the late spring or summer. And with the heat off, an electric fireplace will cost you barely anything to run. Depending on your fireplace model and hydro rates, the maximum expense you should be looking at is a mere 3 cents per hour using this setting. If you decide to sell your home, a wood-burning or natural gas fireplace is difficult (if not impossible) to remove. And even if you can bring it with you, you’ll need to once again go through the aforementioned installation headaches at your new home. Because electric fireplaces and fireboxes are so easy to install, they’re also easier to move if needed. Whether you’re moving to another home or want to move the electric fireplace or firebox to another room in your home, you’ll have a lot more freedom to do so. When you compare the benefits and shortcomings of the various types of home fireplaces available, the best choice should be obvious – an electric fireplace. With the holidays coming up, there’s no better time to make your home more warm and inviting with an electric fireplace. Schedule your free in-home consultation with an Organized Interiors designer to get started. In the past, owning a fireplace simply hasn’t been practical for many homeowners. Natural gas and traditional wood-burning fireplaces present challenges such as cost, the complicated logistics of installing them, and the perpetual work and maintenance required especially for the latter. That’s why electric fireplaces are an appealing alternative that more and more homeowners are turning to. Modern technology has made electric fireplaces a convenient and affordable way to beautify your house or condo, increase your family’s comfort level, and add supplemental heating to your home. Here are 13 reasons why electric fireplaces are well worth considering. An electric fireplace is by far the most affordable choice for enjoying the comforts of a fireplace in your home. They’re much cheaper to install and operate than wood-burning and natural gas fireplaces. Having just the flame running (without heat) on an electric fireplace, which you might want for ambiance, only costs about one or two cents an hour. With the heater and flame on, electric fireplaces typically only cost about 18 cents or less an hour to run. A linear wall-mount electric fireplace is easily installed with direct wiring. Electric fireboxes come in direct wired and convenient electrical outlet plug-in configurations. Compare that to the much more complicated and time-consuming process of installing a wood-burning or natural gas fireplace. Those fireplaces can require expensive masonry and renovation work, venting, a natural gas line hook-up, and a building permit. Organized Interiors can have your electric fireplace framed and installed in far less time than a wood-burning or natural gas fireplace installation requires. Say goodbye to the unpleasant experience of your house filling with smoke after a poorly executed attempt at lighting a wood fire. Because there’s no actual flame, an electric fireplace doesn’t present any opportunity for hazards like smoke, toxic fumes, fires from stray embers, or explosions from gas leaks. The glass on the front of an electric fireplace also won’t heat up and is quite safe to touch. 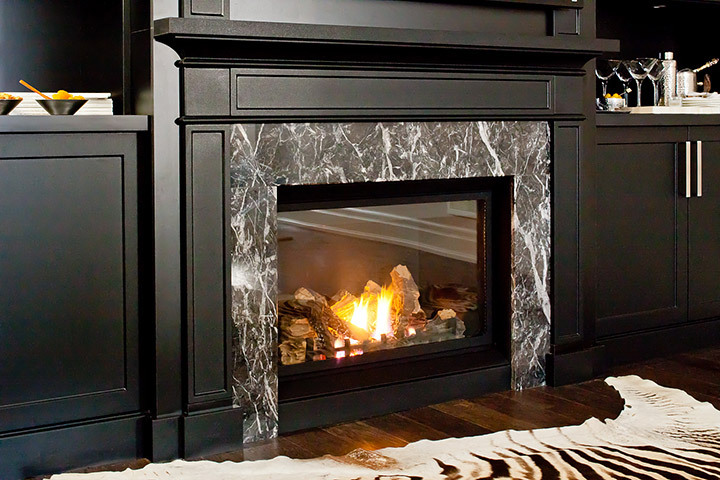 Our Dimplex electric fireplaces provide the authentic look of a roaring fire, without the mess, upkeep, and dangers. When it comes to fireplaces, Dimplex are industry leaders and their patented LED light flame technology accurately replicates the colours and behaviours of real flames. You can even adjust the intensity of the flame, in addition to the dynamic colour themes of the ember bed and the backlighting. Whatever your mood may be, there’s truly an electric fireplace setting to reflect it. If your available space is limited, you can still own an electric fireplace. We have smaller firebox models that are 22 inches wide, right up to linear wall-mount models that are 74 inches wide. Typically, the fireplaces range in depth anywhere from just 5-7 inches. And you can even incorporate your electric fireplace into a custom-built entertainment unit. An electric fireplace will improve the ambiance and aesthetics of your home. Organized Interiors can take that one step further, however, and create a home showpiece with a fireplace feature wall. 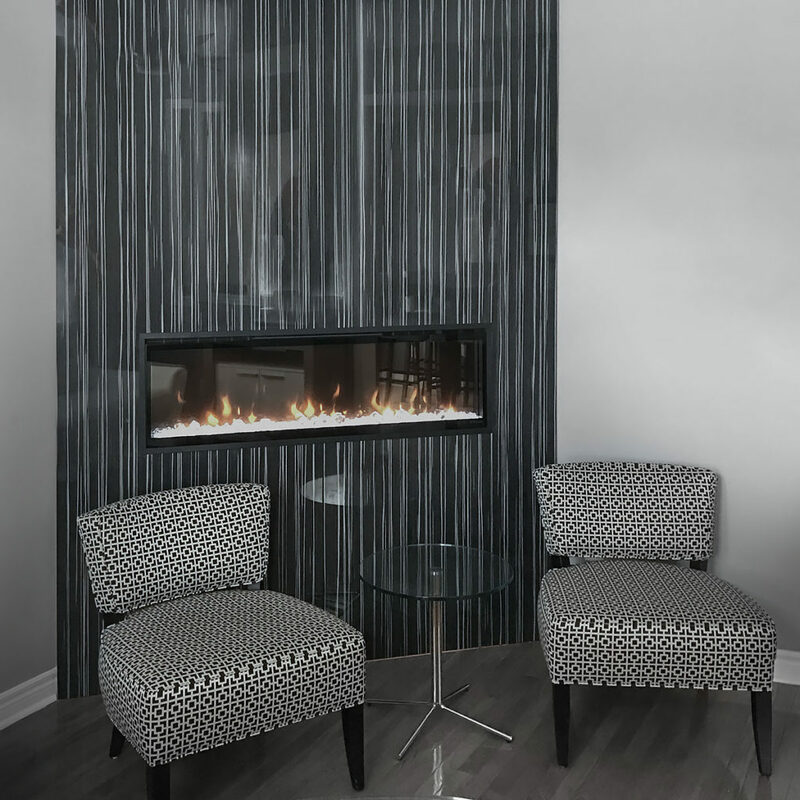 The wall-mount linear fireplace is hung on a beautiful melamine panel, which you can choose from the hundreds of styles, patterns, and textures we have available. It’s certainly hard to beat the dazzling looks of a fireplace feature wall. If your design instincts or budget are leading you elsewhere, however, there are more design choices available. An electric firebox will work just about anywhere. A linear wall-mount fireplace, as the name implies, can be hung on any wall. And as already mentioned, we can incorporate your fireplace into a gorgeous entertainment unit that’s custom-built to your exact requirements. All of these come with a wide variety of colours and styles to choose from. For example, you can customize the media bed (the lower portion of the fireplace) with your choice of glass, sand, river rock, pebbles, or driftwood. Matches and logs or kindling are so last century. You can be enjoying the comforts of a fire instantly with the mere tap of your finger. An electric fireplace’s built-in touch controls and a multi-function remote control provide great convenience and plenty of presentation options. Remember the hassle of scooping up filthy ashes out of your wood-burning fireplace or having to chop and haul in firewood? How about scraping the caked-on soot off of the glass on your old fireplace or wood stove? With electric fireplaces, you won’t have to worry about any of that because they’re very low maintenance. If you enjoy having guests over, an electric fireplace is a fantastic way to create a comfortable and inviting entertainment space. Adjust the fireplace’s settings to reflect the mood of the party — or boost the mood if need be! And rest assured that the electric fireplace itself, with its dynamic display and technological wizardry, will become a topic of conversation among your guests. With natural gas and wood-burning fireplaces, there are severe limitations on where they can be installed. Electric fireplaces pose no such issues. With this kind of flexibility, we can install an electric fireplace just about anywhere in your home. That also means condo dwellers can experience the benefits that electric fireplaces provide. You can use your electric fireplace all year-round, not just during the colder months of the year. Enjoy a relaxing, cozy night in during the middle of summer by keeping the fireplace heat off and just running the flames. These are just 13 of the many reasons why electric fireplaces are a wise choice for your house or condo. One of our design experts would be happy to discuss electric fireplace models and designs with you. For your convenience, we offer free in-home consultations, which you can schedule right now.